Listerine isn’t just for freshening your breath and reducing plaque. Originally in 1879, Listerine was found to be an effective antiseptic for use in surgical procedures! It wasn’t until 1914 that Listerine became the first prescription product in the US to be sold over the counter as a product to kill oral germs. As you can see, Listerine has a long history. Some of the other uses for Listerine are possible because of the essential oils; menthol, eucalyptol, thymol and methyl salicylate. These work together to create a great antiseptic, bug repellant, anti-fungal treatment and more! 1. Clean mold and mildew in your bathroom – Listerine is great for cleaning mold and mildew. Simply soak your cleaning tool in Listerine and scrub away. Another one of the other uses for Listerine in the bathroom is to remove hard-water stains and for shining bathroom fixtures. Bonus – Instead of discarding that old toothbrush, you can use it to get into hard to reach places! Don’t forget to label it for cleaning only. 2. Clean your toilet bowl – Clean your toilet bowl and make it shine by pouring in 1/2 cup of Listerine instead of toilet bowl cleaner. Scrub with the toilet brush as usual. 3. General household cleaner – If you’re planning to use Listerine as a general cleaner in your bathroom, kitchen or on floors, make sure to dilute it with 50% water. It will kill germs and leave a fresh scent. 4. Clean your toothbrush – Kill old germs on your toothbrush by immersing it in Listerine for about 20 minutes. It kills germs in your mouth, so why not use it to clean your toothbrush?! 5. Get rid of dandruff – Listerine can actually help get rid of dandruff! Wet your hair with Listerine and let sit for about 15 minutes before shampooing as normal. After multiple treatments, the anti-fungal ingredients in Listerine should help clean up that embarrassing dandruff completely! 6. Clean your garbage disposal – Pour 1/2 cup of Listerine into your garbage disposal to help kill germs and eliminate that stinky odor. 7. Clean mirrors and windows – Put some Listerine in a spray bottle with 50% water for streak free mirrors and windows. 8. Wound Cleanser – Use Listerine to clean wounds – it is an antiseptic after all. 9. Reduce the appearance if blemishes – Put a bit of Listerine on a cotton ball and apply to a blemish. It will kill the bacteria that causes acne and help it disappear without expensive acne treatment products. Just don’t put it near your eyes! 10. Treat skin irritations – Listerine can help treat rashes and reactions to allergens such as poison oak and poison ivy. It will also help relieve the itch from mosquito bites. 11. Help eliminate foot odor – Use a small amount on a cotton ball and rub over feet to help kill the bacteria that causes odor. 12. Help cure athletes foot – Several treatments will be required but Listerine is said to help cure athletics foot. How? The herbal oils (menthol, eucalyptol, thymol and methyl salicylate) have anti-fungal properties. The Menthol can relieve itchiness, so you should get almost immediate relief in hat area. Additionally, other uses for Listerine as an anti-fungal treatment are to help get rid of jock itch and nail fungus. 13. Alternative to deodorant – While I do find this rather interesting, you can use a bit of Listerine on a towel or cotton ball and rub it on your armpit if you don’t have deodorant handy. Ladies should avoid using this right after shaving to prevent burning! 14. Add to your laundry – You can kill germs in your laundry by adding 1 cup of Listerine with your regular detergent. You can also run a cycle without clothes if you’re washer is especially yucky. 15. Flea removal – If your pet has fleas you can skip the expensive treatments and just use Listerine. Use Listerine as a shampoo and rub in on your pet keeping it away from the face. Let sit for about 5 minutes and rinse. This process will likely need to be repeated. 16. Treat and Kill Lice – It could be worth a shot if your child gets the dreaded lice note home from school. Lice treatments have nasty chemicals, so can try using Listerine before moving to other methods. Just like with the dandruff treatment, wet hair thoroughly and let sit. Make sure you don’t miss any spots! As you can see, there are many other uses for Listerine. 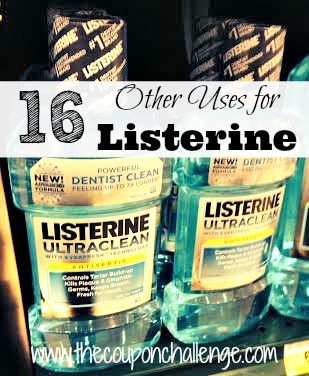 I’ve mentioned 16, but I’m sure there are more uses for Listerine other than mouthwash. What other uses for Listerine can you share? 5 Frugal Uses for Salt – It’s Way More Than Just a Seasoning! 20 Other Uses for Dryer Sheets – Not Just for Laundry! *Historical info of Listerine taken from their website. This was a great post! So many uses for Listerine that I didn’t know about! I am definitely going to try some of them!! Never think the other way to use Listerine other than for mouth wash. I got so many Listerine from couponing. This post really help me the other way to use them 🙂 thanks !! I used Listerine in my daughters hair over night to get rid of lice, after using every OTC lice treatement, prescription lindane, mayonnaise, & ethnic hair oils. The only tried and true lice treatment I have ever used. I also spray my area rugs while house breaking a puppy. They just don’t like the smell I guess. Thanks for sharing! I had no idea it would help house break a puppy! I had a horrible case of strep throat a few years ago and the doctor said her husband, who is an OBGYN, recommended gargling with Listerine (only the original gold label) every day during strep the speed up the recovery, due to the anti-bacterial properties. I seem to get strep once a year, but now this tip always speeds up the recovery and relieves some of the pain. That is such as great tip! Thanks for sharing! thanks for the info. I was also told that it’s good for nail fungi also. Thanks for letting us know about another use for Listerine! My grandma taught me all of these ways to use listerine. She was one of the smartest women I knew. I miss her. I would have not known about the different uses of listerine. Thank you for sharing such a wonderful post.